This book contains selected lectures from the Veritas Forum, a discussion platform set up in 1992 by a group of Christians at Harvard. 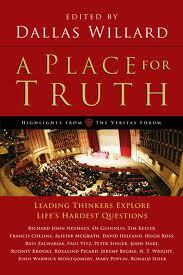 I particularly enjoyed the first half of the book – the lectures addressing truth, faith and science. It is encouraging to be reminded that live Christianity not only withstands intellectualism, but welcomes it, and that a Christian scientist is not a contradiction of terms. It was also see comforting to see that, despite the largely media-driven polarisation of our world on the topic of religion and the active antagonism of a few haters on both sides, civil discussions between Christians and non-Christians are possible.